Are you tired of storing your scrap fabric in ugly, unwieldy Ziploc bags? These Adorable Scrap Fabric Basket Organizers will brighten up all your sewing room shelves and keep things looking neat. They're such an easy sewing project, but so useful for storage. Plus, making your own baskets instead of buying them allows you to mix and match your fabric to give you the look you want. These easy-to-make boxes are durable enough to go anywhere in the house, not just your sewing room, and the pattern is easily adjustable for size. Why spend money on storage boxes when you can make them yourself? These would be cute in my bathroom to hold bobby pins and other small items. I could also see making some for my granddaughter's room. I like the idea that I could wash these if they get dirty and use them again. I just need to be sure I have prewashed the fabric so the colors do not run! Organization is my thing, these scrap fabric baskets will come in handy for all sorts of items in my sewing area. Adorable is exactly the description that fits. These are so easy to make for beginners. And not so beginners. Yes, they are adorable. 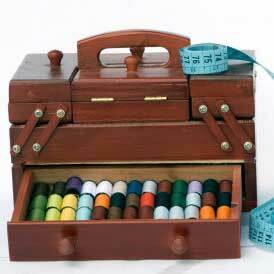 I think every sewist should have some of these easy baskets. Sign up for our free newsletter to see them featured next week along with other beautiful baskets! great idea to help keep fabric in check unless you have almost a room full bought on sale and unable to get to your machine that is covered in fabric.